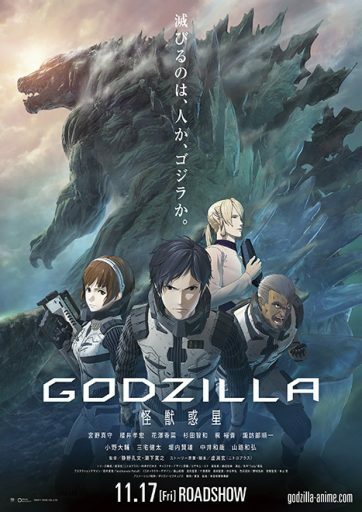 Home » Anime/Manga » Godzilla: Planet of Monsters Review! Godzilla: Planet of Monsters Review! Written by: JediJondee46 on February 10, 2018. This is an anime film from Toho that was released on Netflix on January 17th. First, I will note I’ve grown up with Godzilla. Many people consider them poorly dubbed films with guys in rubber suits (which is true for some of them), but misunderstands that G-films are different genres intended for different audiences; horror, sci fi, fantasy, and goofy action for the younger viewers. In this case, it’s a post-apocalyptic future with Godzilla.Toho returned to the franchise with Shin Godzilla (2016), and now we have the anime. The animation is by Toho Animation and the film is directed by Kobun Shizuno and Hiroyuki Seshita. It opens with the planet Tau Ceti e with the ship, Aratrum, in orbit containing the last survivors of humanity on board. An alert clangs with a shuttle sending armed guards to flank it. Captain Haruo Sakaki (Chris Niosi) is in the shuttle who refuses to leave unless the emigration project is cancelled. He is angry that all of the elderly crew has volunteered to take the shuttle to the planet. Harou says it is save the ship’s resources. One of the elderly passengers, his grandfather, comes on screen and pleads to Harou that they need to leave the ship. Harou surrenders and is taken to a cell while the shuttle makes it’s way to Tau Ceti e. He can see the shuttle from his cell window, it explodes, and Harou screams. It really is humans that cause Harou’s problems, but he blames all of the problems on Godzilla. Harou narrates the flashback which took place in the last summer of 2048. Kaiju are seen across the planet from Kamacuras (giant preying mantis) in New York until Godzilla appears and destroys Kaiju and humans. The last ditch attempt is a massive nuclear attack on Godzilla in Paris. Alien craft appear above the UN building and they announce themselves as the Exif who say humanity’s salvation lies in devotion. Another alien race, the Bilusaludo, appear above Westminster, they need to immigrate to the planet and promise in exchange to destroy Godzilla. Their weapon, Mecha-Godzilla, is inactive and Godzilla rampages the Earth. It’s disappointing that Mecha doesn’t show in this film, maybe a sequel. Young Harou is with his grandfather, his mother and father are racing to board the shuttle in vans, when Godzilla appears. His atomic breath destroys a shuttle, but young Harou escapes with his grandfather. The Aratrum leaves the Earth on the long journey, food rations run low, and people despair. The Exif priest, Metphies (Lucien Dodge), visits Harou’s cell to give him data on Godzilla. Exif are pale with blonde hair like the Nordic aliens from UFOlogy. Harou is driven to learn more about Godzilla to defeat him, Metphies observes Harou, and later the Central Committee is struggling over the loss of resources with Tau Ceti e as an inhospitable planet. The set up is interesting especially the victory by Godzilla over humankind. The crew discuss the report that discusses an electromagnetic shield underneath Godzilla’s skin. The plan is to travel the 11.9 light years back to Earth through a space jump. Metphies discusses the plan with the Bilusaludo leader, Mulu-Elu Galu-Gu (Jamieson Price), a heavy set, tanned alien with pointed ears. They rely on the Gematron computer to make calculations and prepare for a space jump using the ship’s gravitational coil. It seems like the Earth tech has been upgraded with Exif and Bilusaldo tech. Captain Unberto Mori (Keith Silverstein) orders the jump, the starlines distorted into a flowing pattern. The Aratrum reaches Earth orbit some of the crew has never seen the Earth. Probes are sent to scout the Earth. They find that the time on Earth has been 10,000 years later! The probes can’t descend into the thick atmosphere and one is destroyed! Galu-Gu realizes that Godzilla still reigns on the planet. After three days of scans, they determine from the radiation that there is only one Godzilla and there are various theories about his existence. Metphies demands the release of Harou who presents a plan to destroy Godzilla’s electromagnetic shield and body with EMP probes. He asks for three battalions for his plan, 600 soldiers, an Exif priest blesses the soldiers as they had for battle.This is a novel premise that raises the stakes for humanity against Godzilla. Colonel Eliott Leland (Ray Chase) leads the battalions with Harou, Metphies, and Galu-Gu. Metphies tells Harou that he is the one to take on Godzilla. Lt. Colonel Galu-Gu’s unit of combat engineers set up traps at the former Tanzawa Pass, an area in the center of Japan. Colonel Leland’s plan is to attack Godzilla with special forces until the organ generating the electromagnetic shield is found. Then, EMP probes will be used to destroy Godzilla. Harou goes on a scouting mission and Leland adds Master Sergeant Yuko Tani (Cristina Vee) to watch over Harou. They all have environmental suits with helmets. The scouting team moves through the wild forest that now has razor-sharp leaves. Yuko’s grandfather was on the shuttle that exploded. A soldier discovers a clearing where they see buildings, lichen has preserved the shape of buildings. Then, the Company A camp is swarmed by flying Kaiju called Servum, the Latin word for slave. The analysis is that the flora and fauna have some electromagnetic properties like Godzilla and that the forest is exuding the thick fog dampening sensors. Leland wants to order a retreat to the moon, but Harou is angry at giving up the fight. The Servum have disabled or destroyed their ships so Metphies offers a plan to regroup with the others at the Tanzawa Pass which is the rumored encounter area for Godzilla. There is always some smaller Kaiju around Godzilla and we get the set up to when we finally see Godzilla. Metphies tells Harou about traveling through space and seeing civilizations destroyed by creatures like Godzilla, a punishment for arrogant civilizations. Godzilla is approaching and Harou goes to take a hover bike as the landing ship crashes. The animation of Godzilla looks like rotoscoping the reptilian skin of the suit. Still, it is force of destruction, lashing out at anything that attacks him. Harou fires on Godzilla to get an electromagnetic reading, but nothing happens. He decides to crash into Godzilla, but Leland on a Multipodal Battery, a mecha with four spider legs, fires on Godzilla. The Kaiju’s back erupts in blue electrical sparks and he destroys Leland’s Multipodal Battery with his atomic breath. On the Aratrum, the Central Committee is told that command has fallen to Metphies, but he says in this is an emergency. Galu-Gu shows the analysis that a noise was narrowed to Godzilla’s dorsal fin which projects the shield. Metphies makes an announcement to all of the soldiers that he has turned over command to Harou Sakaki. He has a plan to lure Godzilla to the valley to trap him and then use the EMP probes used by power suits. Hoverbikes led by Bilusaludo Major Balu-Be (Rich Brown) and Adam Bindewald (Robbie Daymond) lead the attack to divert Godzilla, while artillery using the Multipodal Batteries strike Godzilla to activate its shield while Yuko and Harou with the power suits seek to destroy Godzilla. It is an all mecha attack, one of the best in anime or in a G-film. If they can end Godzilla, this may be the taking back of Earth for humanity.